Some cookbooks make you want to grab the photos, and take a bite. 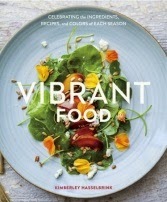 Vibrant Food is one such book. What a treat these food photos are. Just looking at the bowl of Smoky Red Pepper Soup with Pumpkin Seeds and Feta, and I can imagine the interplay of flavors. There are over 200 pages of gorgeous yum, including recipes for some ingredients I have never used. Bee pollen is added to chocolate truffles. Eggs are baked with ramps. While these are two examples of more unusual recipes, the book is sure to please cooks, who might find a nasturtium salad, or squash blossom and green coriander quesadillas, a bit too adventurous. There are also recipes using more familiar ingredients. The Summer Squash Pasta with Green Goddess Dressing, uses fresh herbs, and Greek yogurt. The photo of the squash pasta is lovely. This would be a good treat for the gluten free crowd. Speaking of gluten free, there are recipes that use almond flour. The almond honey cake with poached quince, is one such recipe. As I have never tasted a quince, the recipe looks interesting. If you like food photography, and would like to try some new (at least new to me) ingredients, Vibrant Food is a great choice.